Greetings Naughty Secretary Clubbers! It’s Chris, Jen’s ball ‘n chain, and I wrote today’s blog. It’s a little recipe for making queso blanco. Enjoy! After whipping up a couple of batches of beer with my friend Jeff, I thought it would be cool to try my hand at something else that rots: cheese. Unlike the beer, I did this on my own. Cheese doesn’t really seem to lend itself to the buddy environment that beer does. 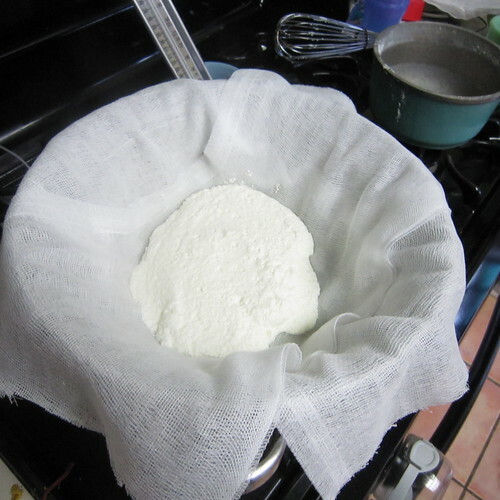 Since I don’t own any cheesemaking equipment or have any experience, I started out small by making queso blanco. It seems weird to call this cheese because I made it in about an hour and there was no fermentation necessary. It also doesn’t melt when it’s heated, so keep that in mind. Line the colander with cheese cloth and set aside. I don’t have a proper colander, so I used the steamer basket that sits in a large pot, which worked nice as a drip bucket. Heat the milk in the saucepan on the stove at medium-low heat (3). 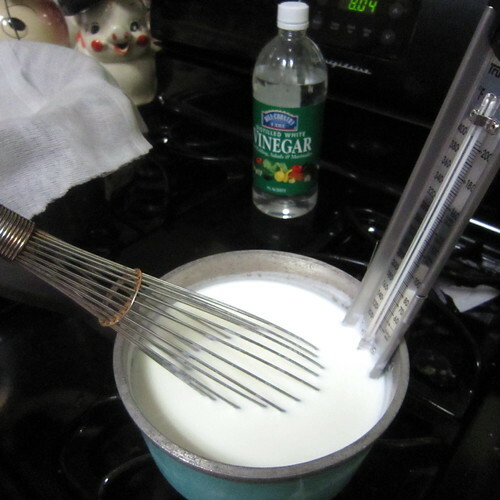 Get that thermometer in there and keep stirring with the whisk because you don’t want to burn it. Slowly heat it to 180 F (82 C if you’re fancy). 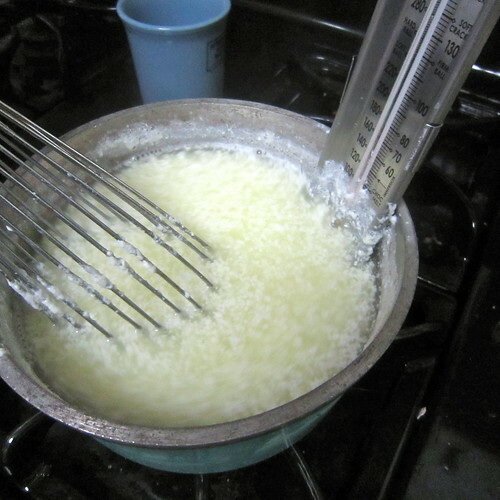 After it’s heated to 180 F, continue stirring with the whisk while slowly adding the white vinegar. The milk will curdle right away. Keep stirring at that temperature for another 10-15 minutes. 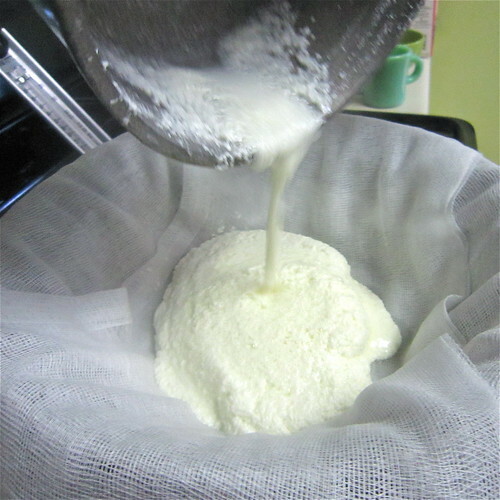 Pour the milk mixture slowly into your cheese cloth lined colander. Let it sit there for about 20 minutes so that it can cool. Next, tie the corners of the cheese cloth together with one end of your your string. 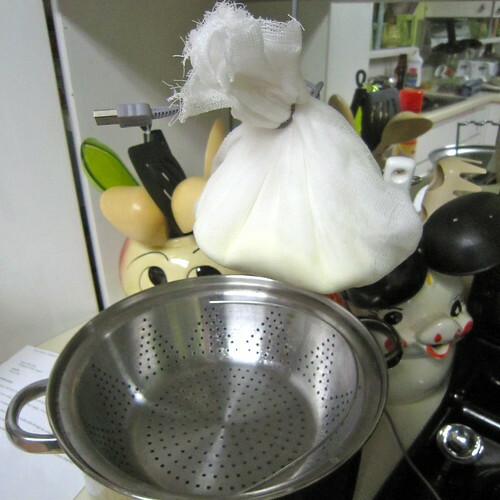 Tie the other end to something and in which you can hang your cheese bag from, like a cupboard knob or faucet, above a pot or the sink. I didn’t have any string either so I used a phone charger cord. I’m resourceful like that. Leave it hanging until it stops dripping. Maybe 30 minutes to an hour. You can put in the fridge or use it right away. I put this in the fridge because I made it in the morning and because I wanted to give it a chance to solidify. 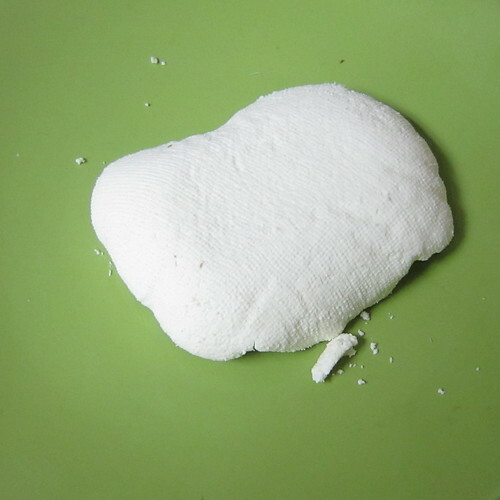 Queso blanco can be used on a variety of dishes. Anything you might put cheese on. 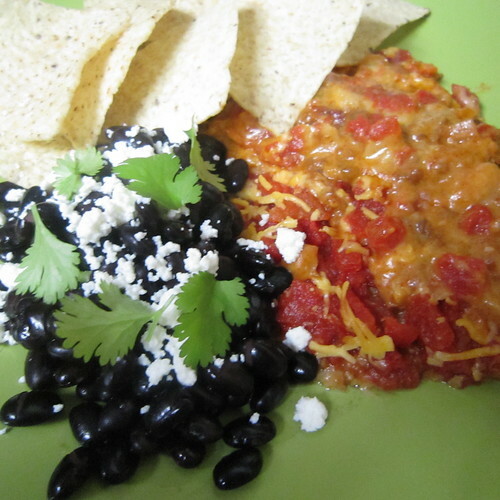 We put it on black beans with a little fresh cilantro. It doesn’t have a strong taste, so you can be liberal with the portions, and it’s just an easy way to brighten up a dish. Posted April 27, 2010 & filed under Cooking Crafts. 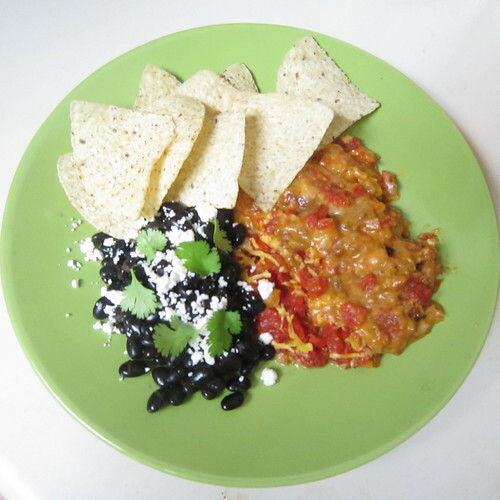 Can cook AND blog? What a sweetheart! You are a good example for Tallulah. Chris, you are the second most adorable husband I know. Perhaps you can pull a Dr. Smith and leave us all homemade cheese on our doorsteps next year for Christmas? Thanks Karly. It's difficult being second place, but I know that I can't compete with Spencer Pratt.